The theme for April's Polish Pick Up is Across the Universe - Planets & Galaxies. Victoria from Blush created a lunar-ific polish! Her inspiration is "It's A Wonderful Life" - specifically the scene where George tells Mary that he'll lasso the moon for her. *While this is a black and white movie, she went with her own dreamy idea of the moon to go along with George's endearing sentiment of capturing the moon for Mary. A soft silvery-taupe base with a violet-blue shimmer, holographic pigment and holo flakes. The formula is fantastic and almost a one coater, but I used two in the photos. The Blush brush is amazing as always. If you have not tried Blush you need to just for the brush! 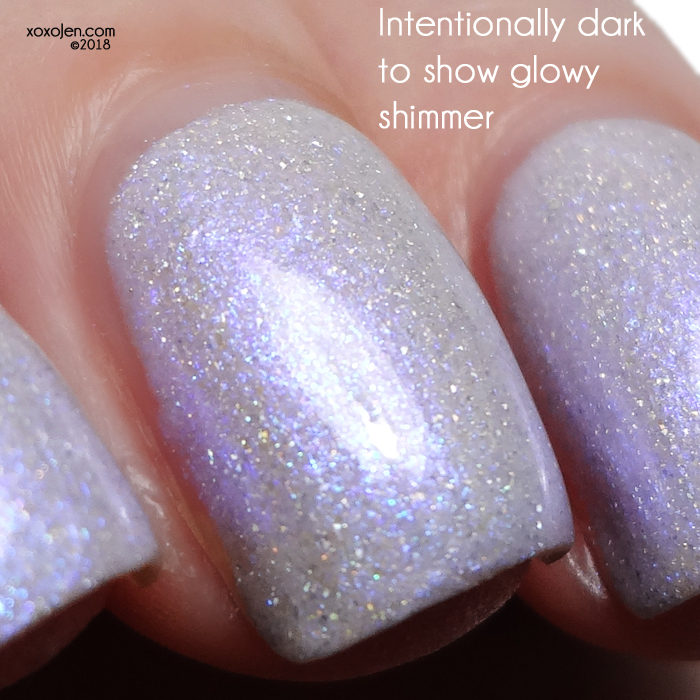 What better time than now with the beautifully glowy shimmery polish!? I don't think I have seen one quite as glowy as this. Lit from within!